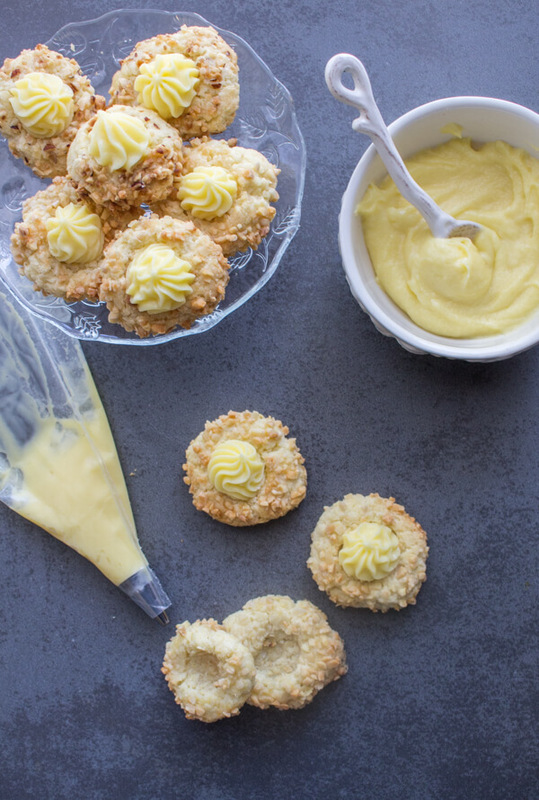 Lemon Thumbprint Cookies are the perfect addition to your Christmas Cookie Recipe to do list. Fast, easy and really delicious especially with an Italian Pastry Cream Filling. When I went to visit friends, actually they are more than friends, they are really my second family. I was given a box of old recipes that my friend’s mother had. After looking through the box for the good part of the day, I discovered some wonderful new recipes. 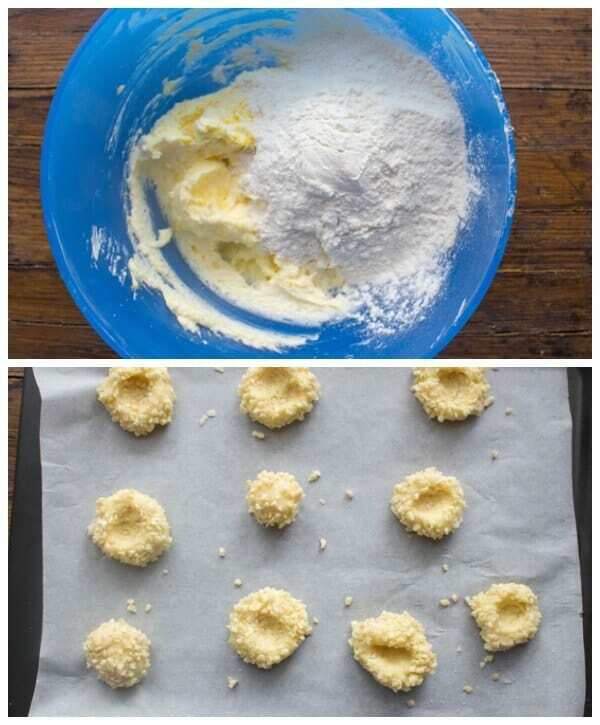 These Lemon Thumbprint Cookies are one of them. I changed it up a little bit but the flavour is amazing. I decided to fill the centres with my Creamy Italian Pastry Cream and it was the perfect combination. I actually was going to freeze these cookies too, like I do with the Christmas Cookies I make in the couple of months before Christmas. But they were such a big hit they were gone in a day. My mother used to make a Thumbprint Cookie, but she would fill them with Jam, which I was not that crazy about. I liked the cookie part but the Jam didn’t thrill me. I can always remember my Mom clipping recipes from the Newspaper and this is exactly what my friend’s Mom did too! From the Winnipeg Free Press, Alison Gillmor (Recipe Swap), 12 days of Christmas Cookies, December 13,2014. After tasting these cookies I understand why she cut it out and never got rid of it. These will certainly become a Christmas Cookie tradition in our home. They are so easy to make and bake up very quickly, halfway through baking I stuck the end of a wooden spoon in the middle, because they tend to puff up, I also repeated this step when they came out of the oven. We want I nice indentation to hold all that delicious Pastry Cream. 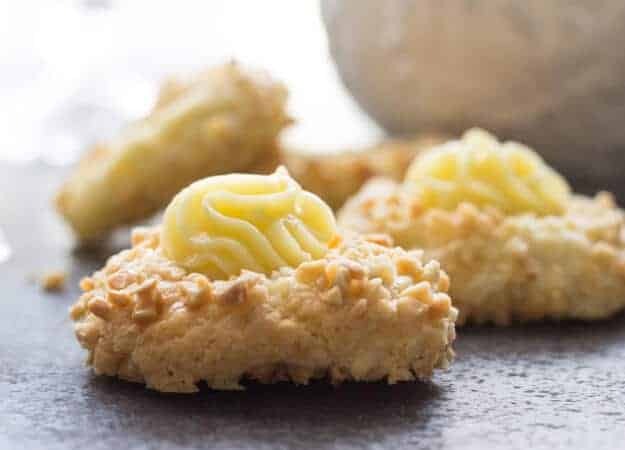 Pastry Cream, lemon Curd or even a simple Buttercream would make the perfect filling for these Yummy Thumbprint Cookies. So whichever you choose, Enjoy! Fast, easy and really delicious especially with an Italian Pastry Cream Filling. Pre-heat oven to 350° (180° celsius). Line cookie sheets with parchment paper. In a medium bowl whisk together, flour, zest and salt, set aside. In a large bowl beat at medium speed butter and sugar until light and fluffy, approximately 2 minutes, add egg yolks and vanilla, beat until just combined. Stir in flour mixture with a wooden spoon until combined. Roll dough into approximate 1 inch balls (2 centimeters). Place egg whites in a small bowl and finely chopped almonds in another bowl. First roll balls in egg whites and then almonds, place on lined cookie sheets about one inch apart. Gently make an indentation with your thumb in every ball. Bake for approximately 15 minutes, at the halfway point check to see if the centres have puffed up, if yes, then using the end of a wooden spoon gently indent again. Remove from oven when done and indent again with wooden spoon if needed. Remove to cool on a wire rack. 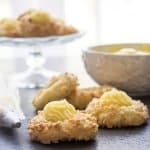 When cool fill with Italian Pastry Cream or your favourite filling. Enjoy! I just made these not to long ago and I ran out of almonds.. So I rolled them in coconut! Delish! Hi Andrea, great idea. So glad you enjoyed them. Hi Lisa, so glad you enjoyed it. Have a great weekend. I have a granddaughter who will not eat nuts and one who cannot eat nuts. I substitute wheat germ for nuts in many recipes. Thanks Kathleen, what a great idea. Have a wonderful Christmas. These look amazing! I can’t wait to try the recipe – thank you for sharing 🙂 I was wondering, do you have a suggestion for an alternative to the almonds? I have friends who are allergic to tree nuts! Thanks in advance. Hello Rosemary, These will make a great addition to my Christmas cookie list! Can these be frozen with the fillong? And do they need to be refrigerated after baking? Thanks so much for a great recipe! Hi LeeAnn thank you. No they shouldn’t be frozen with the filling, I fill them before serving. After they are baked just let them cool and then you can freeze them. Hope that helps. So creative and pretty! I love the filling! 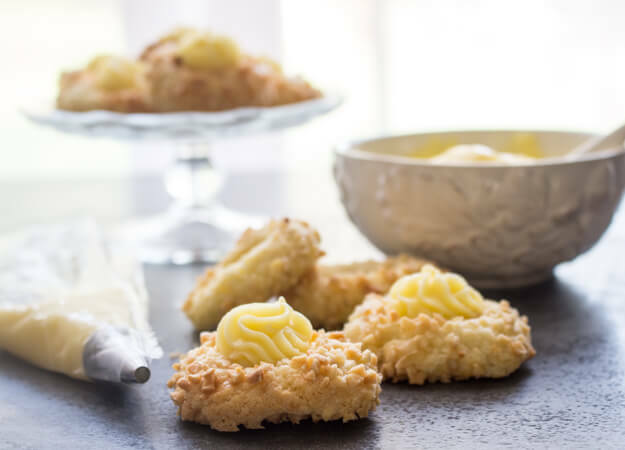 I love your lemon version of thumbprint cookies! They sound (and look) delicious. Perfect for the holidays! Hi Olivia, thanks so much, I love holiday cookies! Have a great weekend. These look delicious Rosemary! I don’t nearly get enough lemon desserts in my life, but I do like your buttercream filling suggestion. So many ways you can switch these up according to each season! Hi Taylor, thank you, I know what you mean anything lemon is good by me. We love thumbprint cookies and I’ve never filled them with jam — always with green or red frosting. I love your lemony look of the filling and the special touch with the frosting. I’m definitely pinning for the filling. Have a great weekend. Hi Marisa, that sounds good too. Thanks and have a great week. YUM YUM YUM. These are setting off my crave-o-meter! They’re pretty as a picture, too.